Review: Clever, interesting, and funny are three of the many ways to describe The Rivalry . John Feinstein puts together an award-winning story that will keep you wanting to read more. This story falls in with sports fiction books. Susan Carol Anderson and Stevie Thomas are teen reporters who are covering the Army/Navy college football games. Stevie mostly covers Army and Susan Carol mostly covers Navy. This amazing duo writes about lots of different things concerning the Army/Navy rivalry. After Stevie pleads with his parents to let him cover the Army/Navy game, he heads to Washington D.C for a big Washington Post and Washington Herald meeting. Stevie later goes to the Army Post to dig up stories that the Washington Post or Washington Herald may want to publish. While at Navy, Susan Carol is covering the Navy side of this famous rivalry. When she goes to a Navy/Notre Dame game, the referees call everything badly for an unknown motive. Susan Carol writes a story about the obvious bad calls. At Army, a hole in security lets unknown intruders cause distress at the Army/Navy lunch. When interviewing players Susan Carol and Stevie find that, there could possibly be a threat to the President of the United States. This concerns many people. There are unknown conspiracies that take form from interviews and Susan Carol's dad. Who will win the Amy/Navy game? I absolutely love this story! The Rivalry kept me on my toes and ready to read. I did not want to put the book down. I feared something interesting would happen and I would have to wait. Not only does The Rivalry have suspense, it also has numerous funny parts. If you want an all-in-one book with suspense, action, and humorous writing, there is no better book. I laughed at the writing of the story. There are many good one-liners and ideas kept through the whole story, such as Susan Carol being so much taller than Stevie. John Feinstein writes in a different format. He goes back and forth between where what is happening at the Army Post and the Navy Yard. He also throws in what is happening on game day. This gives a rounded knowledge of what is happening everywhere. Reading the title of each chapter helps you know the time, place, or big event in the next chapter. I was seriously hooked on the ending. I could not do anything until I finished the book. I was sucked into the world that John Feinstein created and could not bring myself to jump out from the pages of the story. I felt excited every time I flipped the page because I knew the adventure would continue. The ending is extremely unexpected. I thought that it was going to be something totally different. The details in The Rivalry come into play at the end. I imagined the ending to be something with then president but it was not. The story leads in a direction then you look at it in a different way and the ending unfolds. The Rivalry goes beyond five stars! Review written by Kathryn (6th grade student). We would like to thank Random House for providing a copy of THE RIVALRY: Mystery at the Army-Navy Game for this review. 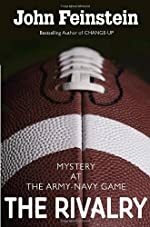 Have you read THE RIVALRY: Mystery at the Army-Navy Game? How would you rate it?